Mrs. Harrison, we'll try not to squirm! Mrs. Harrison, don't be too stern! You can meet the very nicest people on the internet; just like I have! I was the lucky winner of Mrs. Harrison, the School Marm Blackbird, from a drawing on the blog MarthaandJane (http://marthaandjane.blogspot.com/) This is a delightfully whimsical blog that I encourage you all to visit. 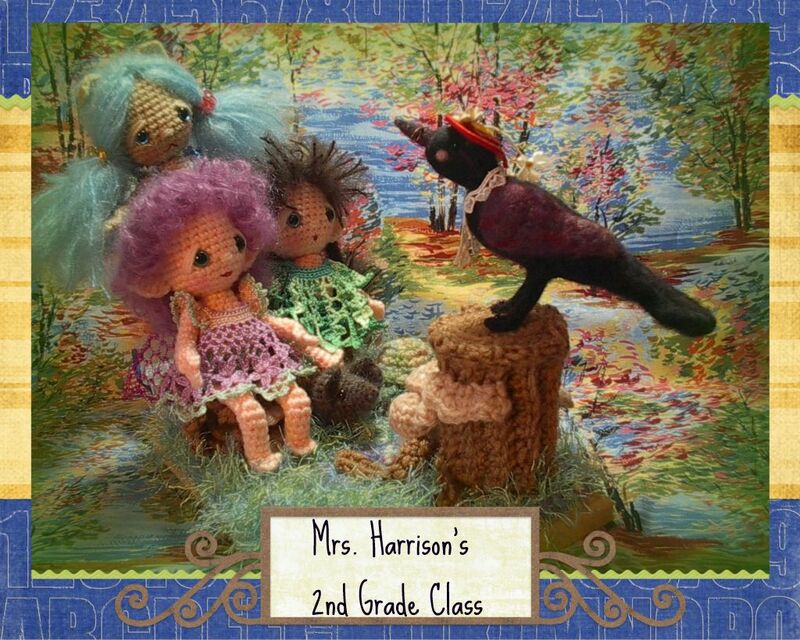 Mrs. Harrison is a beautifully needlefelted work of art by April Ross, and a teacher of young fairyfolk and their friends. Thank-you so much, April and Helen! This is the time of year I start thinking about Christmas; crocheting for Christmas, that is. If I start in July, I have plenty of runway ahead of me and don't feel rushed and panic'd as Thanksgiving rolls away and the Big Day looms :-) Since I love to crochet, making crochet items for Christmas is no hardship. I'd love to see Christmas become a simpler and happier holiday. I think handmade can go a long way toward this end. Also, make doing something for others less fortunate a part of your Christmas traditions, and ease up a bit on all of the store bought items. We place so many expectations on ourselves at Christmas that is it sometimes impossible to live up to them all, and we wonder where the joy has gone. The only changes I made to the book bag were to use half double crochet instead of double crochet. I made three more increase rows, and five additional body rows for the bag. It turned out great! These are for my three nephews, ages 7, 5, and 3. Making stuff for kids is the most fun of all. Fairies are too light and sweet. A quick glimpse; don't look away! A fairy child is here to play. Yesterday, Larry and I and my Dad (the photographer of this pic) rode 22 miles of the Great Greenway Tour, a Rail-Trail annual ride out of Muncie, Indiana. And, just like last year, we got DRENCHED! It is hard to tell from the above picture, but we are standing in the rain at the end of the ride, and soaked through and through.